What Happened to the Bombay Furniture Outlets? There used to be a large number of Bombay furniture outlet stores in the United States. However, the recent economic recession resulted in the company filing for Chapter 11 bankruptcy in 2007. In February of 2008, the Bombay company was bought by a private, family owned Canadian company. Bombay furniture and home accents are now sold at stores in Canada and online. Licensed product lines are also available exclusively through Bed Bath & Beyond, Burlington Coat Factor, Kroger, CVS and Fred Meyer. The Bombay Company started out as a New Orleans based mail-order company, founded in 1975 by Brad Harper. Harper eventually opened two retail stores in New Orleans and in 1980, he sold the rights to Tandy Brands, Inc.
Before becoming 100 percent Canadian owned in 2008, Bombay signed an agreement in 1979, with Canadian entrepreneur Robert Nourse to begin selling the furniture brand in Canada. Nourse began opening retail Bombay stores in Canada, which over the years to come, proved to be more profitable and successful than the U.S. stores. By the end of 1983, the Tandy executives decided to merge the more successful Canadian operations with the struggling U.S. operations and put Nourse in charge of both. 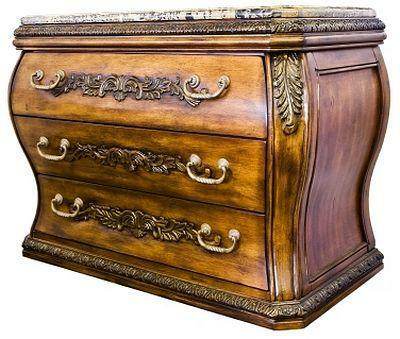 Bombay's original product line consisted of 18th and 19th century mahogany stained reproduction English style furniture such as plant stands, nightstands and butler tables. The furniture was imported from manufacturers in the far east. By the mid 1980's, the company had expanded their product line to include other home accessories such as mirrors, lamps and printed textiles for home decorating. Nourse's wife, Alexandra, had taken charge of design operations and brought a more feminine touch to Bombay's furniture style, with traditional influences such as Chippendale, Hepplewhite and Queen Anne. At the very end of 2009, William S. Hollands was commissioned as chief merchant by the Bombay company to oversee the company's operating unit, which handles U.S. licensing for the Bombay brand. In September of 2010, QVC and QVC.com made about a dozen pieces of Bombay brand home furnishings available for purchase in the U.S. Licensed items are now available in several off-price, supermarket and drugstore locations.